Settled on the banks of River Tungabhadra, Hampi is a temple town of Karnataka, formerly the capital of the royal Vijayanagara Empire. The name "Hampi" was derived from "Pampa", the old name of River Tungabhadra, daughter of Lord Brahma. This town was declared as a UNESCO World Heritage Site as it bears the ruins of palaces and temples belonging to the Vijayanagara Empire, thus immortalizing the royal heritage. Since it is located just about 350 km from Bangalore, Hampi makes for an ideal historical getaway that must be visited this weekend! The ideal time to visit Hampi is between the months of October to March when the climate is pleasant and cool. Monsoon rains might make walking around boulders hard and slippery. However, if you wish to witness the grandeur of celebrations of Dusshera or Vijaya Festival, which is the festival of Hampi, then October to November are the months to visit. Read further to know about the places on the way. Nelamangala is a town situated on the outskirts of Bangalore at about 26 km distance. It is an abode of some of the most beautiful temples. Binnamangala, Vishwa Shanti Ashram, is a serene park with huge statues of Panduranga and Vishwaroopa Vijaya Vittala. It also has Geeta Mandir, Ashtalakshmi Temple and Vinayaka Temple. Lakshmi Venkataramana Swamy Temple is unique as they worship the main deity along with his royal vehicle, Garuda. It consists of three beautiful shrines, surrounded by pillars, all structured in Chola style of architecture. Shivagange is a beautiful mountain peak, located in Dobbaspet, 27 km from Nelamangala. The name "Shivagange" originates from the fact that this peak is shaped in the form of a Shivalinga, and a local spring that flows is locally known as "Ganga". The altitude of this peak is about 2,640 ft making it a great spot for trekking and rock-climbing. The entire trek is for about 2.3 km, with a well-marked trail to the top, and safety rails available at steep spots. Shivagange is also known as "Dakshina Kashi" (Kashi of the South), because it has a number of temples to visit, such as Gangadhareshwara temple and Sri Honnammadevi Temple, which are found inside a cave. Located another 26 km from Shivagange is the district of Tumkur, also known as the City of Coconuts. This buzzing industrial town is famous among tourists for hiking on the Siddaganga Hills and Ramadevara Betta. Sri Siddaganga Mutt, built in 15th century AD by Sri Gosala Siddeswara Swamy, is located close to the hills. It houses about 8000 children and provides free education and boarding. About 15 km off-route will take you to the Devarayanadurga, a small hill-station that falls between the river basins of Kaveri and Krishna. Devarayanadurga is also famous for rock-climbing and trekking. It also has a natural spring flowing nearby called "Namada Chilume". Sira is a Taluk, located 55 km from Tumkur. Historically, Sira was ruled by the Vijayanagara Empire from 1638-1687, and later went into the hands of the Sultans of Bijapur, Mughal Empire, Marathas, Wodeyars and finally the British Raj. Sira Fort, or the Kasturi Rangappa Nayaka Fort, is a popular tourist hotspot that was first laid out when Sira was under the rule of Vijayanagara Empire. This fort made of stone and bricks were named after the Palegar, Kasturi Rangappa Nayaka, who was the prevailing ruler at the time of its construction. Narasimha Swamy Temple is another enthralling temple that must be visited in Sira. Kaggaladu, a small village situated around 13 km from Sira, is home to many species of birds. Out of which, Painted Storks and Grey Herons are in the largest number. Kaggaladu has the second largest number of Painted Storks, coming second to the Kokkrebelur Bird Sanctuary of Maddur. The best time to visit this sanctuary is between February and August. Hiriyur is a small town, well-known for the Vani Vilasa Sagara or Mari Kanive. This dam is located about 60 km from Sira and was built by the Maharajas of Mysore in the pre-independent India, across the river Vedavathi. A panchavati garden nearby is a perfect picnic spot and therefore, has been a tourist attraction for many years. Originally known as Chitrakaldurga, this city located about 43 km from Hiriyur, is a beautiful place bordered with rocky boulders. The famous Chitradurga Fort is an all-time tourist attraction, with 18 temples in the upper fort and one enormous temple in the lower fort. Chandravalli Valley which is 3.6 km from the Chitradurga bus stop, is formed by three hills, which is of historical significance. Many materials belonging to the Hoysala and Satvahana dynasties are found here, because of which it has been made into an archaeological site. Jogimatti, Ankali Mutt and Thamatekallu are the few other places of significance here. Virupaksha Temple, acclaimed as UNESCO World Heritage Site, is a magnificent monument. Dedicated to Lord Shiva, this temple shows architecture at its finest. A very intriguing fact about this temple is that it was built in such a way that the river Tungabhadra could flow along its terrace, then to the kitchen and then flow out of the outer area! Sasivekalu Ganesha Temple, Lakshmi Narasimha Temple and Pattabhirama Temple are some of the other exquisite temples that have to be visited around Hampi! Lotus Mahal, also called as Kamal Mahal or Chitragani Mahal, gets its names from the lotus-like structure of this palace. It is a beautiful building found inside the Zenana Enclosure, a separate area that was used by the women of the royal dynasty. The balconies and passages that are covered with domes resemble the opening of a lotus bud! The Mahal is open from 8 am to 6 pm for tourists to visit. 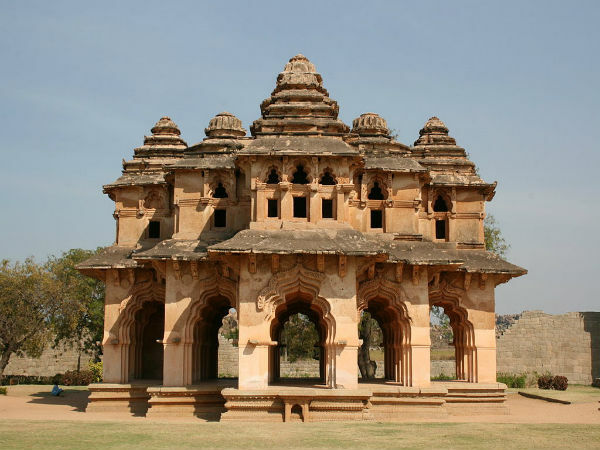 Located on the northeast part of Hampi, it is a marvellous temple with stone structures of chariot and beautiful musical pillars.It is considered to be the grandest structure of all in Hampi, as it shows maximum excellence and creativity of the artisans of the Vijayanagara Dynasty. The musical pillars were made of huge, single pieces of stone, a marvel that leaves anyone spell-bound. Mahanavami Dibba, or the House of Victory, is a magnificent stone platform. It was built by King Krishnadevaraya after the conquest over the kingdom of Udayagiri, which is the present-day Odisha. This platform is 12 m high and was used as a stage by kings to watch various performances. It has two stairways to reach, both on the opposite sides, with the front side decorated with beautiful carvings. The Hemakuta Hill, located on the southern side of Hampi houses not just one, but a complex of temples! The temples on this hill are triple-chambered structures, compactly built with pyramid-like roofs made from granite, which is interestingly very different from the typical Vijayanagara architectural style. It has been confused for being Jain temples for the same reason. Most of these temples are dedicated to Lord Shiva. Located just outside the Zenana Enclosure, are the elephant stables that were built to protect and shelter elephants. It happens to be one of the very few structures that is intact in all its glory, without suffering much damage from the attack by the Mughals. It is built in a fine Indo-Islamic style of architecture, with 11 domes in total and one huge dome at the centre. With no doubt, Krishna Temple is also adorned with pillars, hall and shrines of exquisite work of art. A unique feature of this temple is that there are inscriptions of epics on the tower walls. Apart from which, it matches the signature style of the Vijayanagara architecture. Situated at the heart of the royal arena, is a small but wonderful Hazara Rama Temple, dedicated to Lord Rama. It is a beautiful shrine, which, once upon a time, was a private temple of the royal family. The temple has bas relief sculpture and panels representing the story of Lord Rama. "Hazara Rama" literally means a thousand Rama, indicating the magnitude of relics portraying his story.